In the first decade of the twentieth century, Muttock faced a potential health crisis of epidemic proportions when between 1909 and 1914, that community was afflicted by an outbreak of malaria, a disease seemingly unknown in Middleborough before 1896. The fact that it was able to avert such an outcome was the result of extreme vigilance on the part of a number of members of the community rather than the actions of the community’s public health officials. Malaria and the similar yellow fever were greatly feared before 1900. Middleborough residents had long been accustomed to hearing of the dreadful yellow fever epidemics which periodically plagued the South, and like communities elsewhere, Middleborough was fearful of the disease’s potential appearance within its corporate bounds. Consequently, much mystery and caution surrounded a possible local case of yellow fever in late 1870. “It is whispered that a death from yellow fever has occurred in the village of Middleboro’”, reported the Plymouth Old Colony Memorial in November, unable to confirm its report. A generation later, reports of the yellow fever which plagued Spanish-American War soldiers continued to fuel local fears concerning yellow fever and helped foster the community’s apprehension concerning malaria. At the time of the 1909 outbreak, the cause of malaria was not well understood. Originally thought to have been an airborne disease, malaria in 1827 was given its modern name from the Italian for “bad air”, a term which replaced earlier names including intermittent or remittent fever, fever and ague, and marsh miasma. By the 1880s, a connection between malarial infection and stagnant sources of water was purposed. In 1881, Dr. J. F. Adams indicated to the American Public Health Association regarding the incidence of malaria in New England that malarial communities were “found to be, with scarcely an exception, on the border of rivers, or adjacent to swamps, ponds or artificial reservoirs…. It has thus shown a decided affinity for water.” It would not be for several more years, however, that the work of others would reveal that it was not the water, per se, that was responsible for the disease, but the fact that standing water constituted a prime breeding ground for the anopheles mosquito, the primary agent by which the disease was spread. At the time of Middleborough’s first modern malarial outbreak in 1896-97, it was believed that it was a germ inherent in the exposed mud which was the causative agent of malaria, and this view would hold sway for many years. A concurrent malaria outbreak in Uxbridge, Massachusetts, in 1896, however, prompted Dr. Theobald Smith to suppose that “the malarial germ is caused by mosquitoes, not all mosquitoes to be sure but only those in infected localities. Anything that favors the breeding of these pests like stagnant ponds, pools, sewers, etc., would favor it.” Smith’s hypothesis, accurate though it ultimately was, was not made public at the time due to the uncertainty of the Massachusetts State Board of Health, with the consequence that measures to prevent and eradicate the disease would be delayed for years. In September, 1898, Charles E. Grinnell, a summer resident on the Washburn estate at Muttock, complained of malarial conditions which had been prevalent in the neighborhood during the two previous years. Believing the cause to be the industrial pollutants and raw untreated sewage which since 1886 had been permitted to be dumped into the river, Grinnell and others petitioned the Middleborough Board of Selectmen to address the matter of discharges into the river. Independent of the town and at the behest of Grinnell and the other Muttock complainants, a State Board of Health engineer viewed the conditions at Muttock, as well as the Middleborough sewer system, and the Commonwealth held two hearings on the situation of the Nemasket, the town’s disposal of sewerage and the prevalence of malaria at Muttock. Grinnell, himself, was successful in having a bill introduced into the Massachusetts legislature by Representative Dewey of Westfield, entitled, “An Act to Authorize Middleborough to Construct a System of Sewerage and to provide for the payment of the Cost thereof”. The bill received no support from town officials, who balked at the treatment plant’s price tag and who took umbrage at the Commonwealth exercising its authority on behalf of the community’s public health, and it is noteworthy that it was an official from the opposite end of Massachusetts who sponsored the bill rather than Middleborough’s own representative. The sanitary conditions of the river, and particularly those at Muttock, became a source of grave concern following the start of the twentieth century. It was argued that the abandonment of the Muttock water privilege and subsequent deterioration of the dam had lowered the level of the river, allowing for the exposure of mud flats and the rise of “offensive odors”. More concerning was the prevalence of malaria in the neighborhood after 1909 with 13 of 15 houses at Muttock being affected. The first cases to come to the public’s attention were initially outside Muttock. Edward H. Stafford, Jr., of 123 South Main Street, then a recent graduate of Middleborough High School, suffered an attack of the disease in August, 1909, which was reported in the Middleboro Gazette on August 13. The following year, in October, 1910, George R. Sampson of Everett Street, was similarly stricken. Undoubtedly, Sampson’s illness attracted the attention of much of Middleborough, given Sampson’s local prominence as a brick manufacturer, Peirce Trustee and former Massachusetts state representative. Notably, the Nemasket River ran through the rear of Sampson’s property which was dominated by a large Greek Revival style home. A single paroxysm of simple ague may come upon the patient in the midst of good health or it may be preceded by some malaise. The ague-fit begins with chills proceeding as if from the lower part of the back, and gradually extending until the coldness overtakes the whole body. Tremors of the muscles more or less violent accompany the cold sensations, beginning with the muscles of the lower jaw (chattering of the teeth), and ex-tending to the extremities and trunk. The expression has meanwhile changed: the face is pale or livid; there are dark rings under the eyes; the features are pinched and sharp, and the whole skin shrunken; the fingers are dead white, the nails blue. All those symptoms are referable to spasmodic constriction of the small surface arteries, the pulse at the wrist being itself small, hard and quick. In the interior organs there are indications of a compensating accumulation of blood, such as swelling of the spleen, engorgement (very rarely rupture) of the heart, with a feeling of oppression in the chest, and a copious flow of clear and watery urine from the congested kidneys. The body temperature will have risen suddenly from the normal to 103 or higher. Today, the symptoms would most likely be attributed to influenza. The cure for such a malady was undoubtedly substantial dosages of quinine, then the only medicine known to ease the symptoms of the disease. Patent medicine makers also offered treatments with companies like J. C. Ayer & Company of Lowell manufacturing cures for malaria. Ayer’s Malaria and Ague Remedy, produced since the 1850s, consisted of 12 grains of orange peel, 8 grains each of quinia, cinnamon, Jamaican ginger, and peppermint, 4 grains of cloves, 3 ½ drachmas of glycerin and water “sufficient to make one fluid ounce”. The company touted it as “the very best medicine you can possibly take for ague or malarial poisoning, in all its forms. The medicine quickly and thoroughly destroys the cause of the disease and renders great aid to nature in bringing about a speedy and complete recovery.” Undoubtedly, such remedies found a ready sale in some of Middleborough’s pharmacies at the time. In 1910, with the number of cases of “malarial infection” mounting, Ferdinand Landgrebe of North Street, along with others, petitioned for an improvement in the sanitary conditions of the river. Their concern regarding the health conditions at Muttock was also linked to the pollution in the river. Since 1886, raw untreated sewage from Middleborough Center had been dumped into the river and, combined with the industrial pollutants discharged, created a rank and frequently fetid stream. 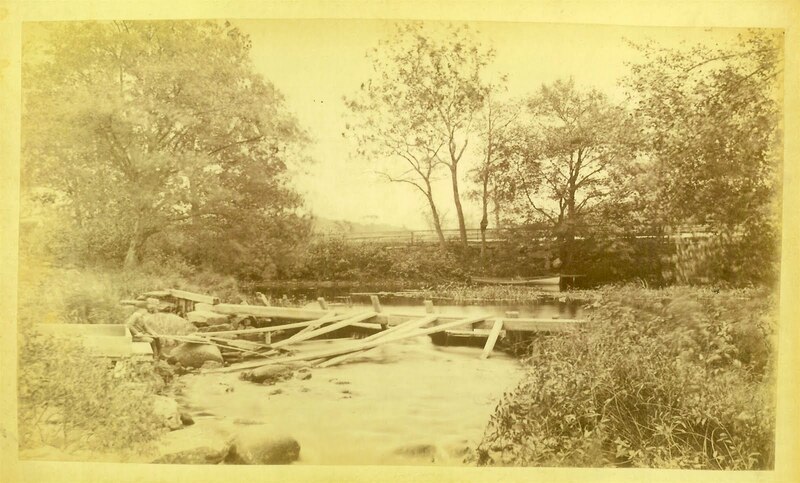 Ultimately, a bill (“An Act – To Authorize the Improvement of the Sanitary Condition of the Nemasket River and Adjacent Meadows in the Town of Middleborough”) was introduced into the Massachusetts state legislature by Representative Holmes of Kingston. The bill proposed the improvement of the river between the Lower Factory and a point just downstream from the dam at Muttock and would have authorized the town “to construct a dam and such structures as may be necessary, to prohibit or regulate the pollution of the river by sewage or other matter”, and to acquire and hold lands and buildings as necessary, the expenditure not to exceed $1,000. The bill simply provided the town of Middleborough with authority to act in the matter; it did not compel it to take action. In testimony before the legislative committee on public health, Muttock residents were scathing in their attack upon the unsanitary condition of the river. 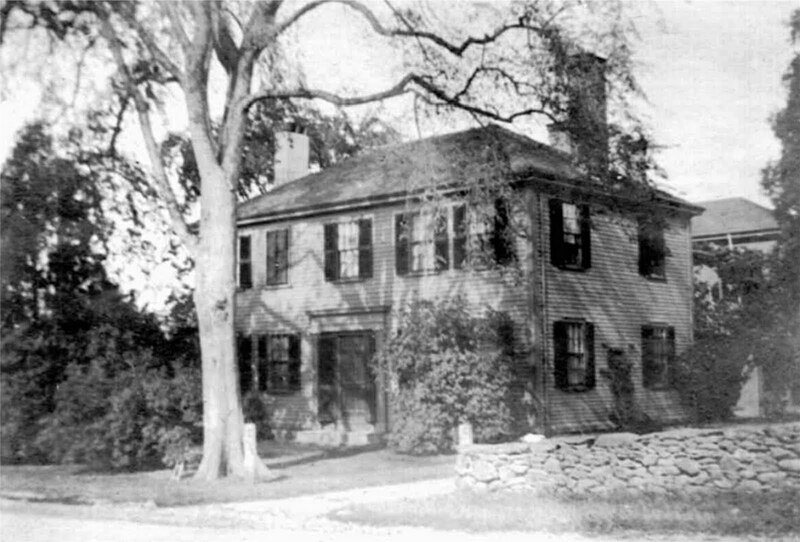 One of the Misses Winslow characterized the conditions there as “shocking” and told the committee that she and her sister were compelled to keep the windows of their house midway up Muttock Hill on Nemasket Street closed, even on the hottest of days, determined to avoid admitting the stench rising from the river on those days into their home. (In so doing, they unwittingly prevented malaria-bearing mosquitoes from entering the premises, thereby avoiding the sickness which plagued the neighborhood during 1910 and 1911). Representative Holmes who spoke in favor of the bill, stated that the failure of the dam many years previously had resulted in the exposure of the river’s mud flats and the resulting offensive odors. “… In the fall when the air is damp, malaria is prevalent, and even children are sufferers from the disease,” the committee was informed. In the meantime, 1911 witnessed a string of attacks. John G. Tinkham, John Perkins, and Levi Tinkham were all reported as ill with the disease during June and October, while George Sampson apparently suffered a relapse in July. By mid-July, Tinkham, a letter carrier, had recovered enough to resume his duties delivering mail. In September, 1913, Mary MacAuley fell ill with the disease, as did Lester Newton (who had a “severe case” in April 1914), the Newton twins and Wendell Sturtevant. Undoubtedly, there were more cases. How many we shall never known as doctors were then not legally required to report cases of malaria. Sturtevant appears to have been the last to have contracted the disease in Middleborough. Ultimately, it was the partial reconstruction of the dam at Muttock rather than the actions of the community’s public health officials which brought the outbreak to an end. With a higher level of water maintained in the river, the shallow pools of stagnant water where mosquitoes bred were largely eliminated, thereby helping control the disease. Not until 1914 was malaria a reportable disease in Massachusetts. 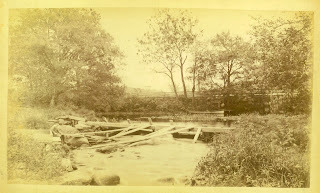 Nemasket River at Muttock, Middleborough, MA, cabinet view, late 19th century. This view depicts the Nemasket River at Muttock following abandonment of the industrial works there. The remnants of the dam shown in the photograph were washed away in a freset in the 1880s, but already the low water levels that encouraged the propagation of anopheles mosquitoes is apparent. 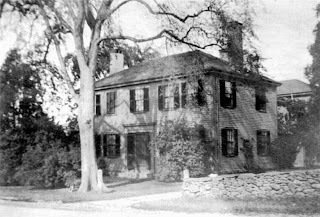 Winslow House, Nemasket Street, Middleborough, MA, photograph, c 1900. During the hottest summer days, Isabella and Maria L. C. Winslow who occupied the Weston House on Nemasket Street at Muttock refused to open their windows, determined to avoid admitting the stench rising from the river into their home. In so doing, they unwittingly prevented malaria-bearing mosquitoes from entering the premises, thereby avoiding the sickness which plagued the neighborhood following 1909. One of the Misses Winslow characterized the conditions at Muttock as "shocking".